Tahuata (not Tuahata as I misspelled it previously) was great. Hiva Oa was probably already worth the ordeal of the passage out here but, in case it wasn't, Tahuata definitely was. According to one of our guide books, Tahuata is the smallest inhabited island in the Marquesas archipelago, has no bank, and just one bed and breakfast type place to stay. There's a really nice anchorage on the island so quite a few cruising boats stop there but it's definitely not what you'd call a tourist destination. The wind was blowing pretty good on April 20th so it only took us about 2 hours to sail south out of Tahauku Bay near Atuona on Hiva Oa, around Teaehoe Point and through the Bordelais Channel that separates the two islands and around to Hanamoenoa Bay on the northwest side of Tahuata. We anchored in about 25 feet of water clear enough to watch the anchor dig into the sand below us. We spent the first couple of days there working on repairs and projects, snorkeling, and hanging out with our friends Alex and Ryan who followed us from Hiva Oa on their wooden Mariner 40 'Shalimar'. On May 3rd, 3 guys in a wooden outrigger canoe came into the anchorage and went around to all the boats offering to trade fruit for stuff. 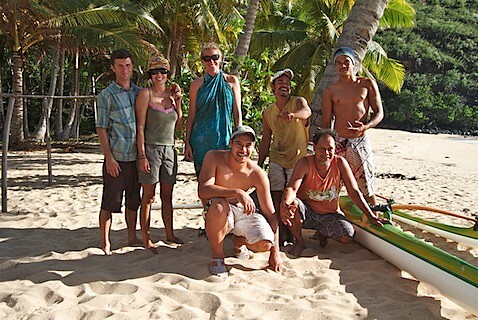 One of the guys, Nahau, is a surfer and, seeing our surfboards, tried to tell us about waves in the area. We speak almost no French and none of these guys speak much English so the signal to noise ratio was pretty dismal until our friends Ryan and Alex came to the rescue. Ryan is from California so he's as confused by French as we are but Alex grew up in France and went to University in Paris. She was able to ascertain that in addition to telling us about some waves that could be surfed, the three guys (Fiu, Mohuho, and Nahau) were inviting the four of us to go spear fishing with them the next morning and then eat with them at their place afterward. Christine and I have both been hoping for the opportunity to hang out with locals, get to know them, and see how they live so we answered with an enthusiastic yes. We waited for an hour or more past the appointed time for our new friends to show up but since we understand that things happen at a different pace out here we weren't bothered. Once the outrigger had arrived, Christine and I hopped into our dinghy, Alex and Ryan got into theirs, and we followed Fiu and Mohuho around the point and out to a little reef a ways offshore. Christine got ready to throw our little dinghy anchor into the water and Mohuho motioned for her to stop. Instead, Fiu dove down 25ft or so and tied outrigger's bow line to a some exposed rock on the reef below and then directed us to tie our dinghies to the outrigger. 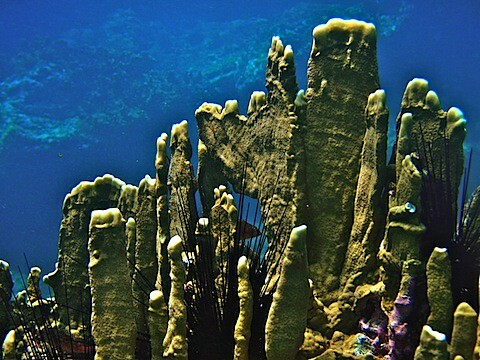 They know the value of their reef and don't want anchors damaging it. 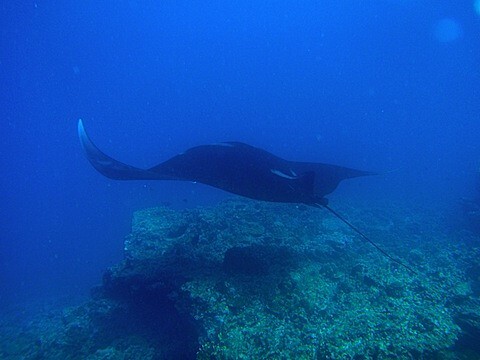 For the next hour or two, we snorkeled around watching giant manta rays (one having a wing span of at least 10 or 12 feet) swim under us while Fiu and Mohuho collected lunch with their spear guns. They got a large-ish Octopus (I think it was cyanea), some kind of snappers, and some surgeonfish. Given how much I appreciate cephalopods for their intelligence and complex behavior, I had mixed feelings about seeing an octopus struggling and inking with a spear through its face but, since these guys had been nice enough to feed us and invite us along, I wasn't about to complain. The shallowest part of the reef was over 20 feet below us so it took some skill to dive down there, line up your shot, and spear a fish. When they saw that I could make it to the bottom and stay there a little while, one of the guys offered to let me take a shot with his spear gun. I gave it a try and missed my fish and, unfortunately, bounced the spear off a rock. I felt like a bit of a doofus but the spear didn't appear to be bent and it wasn't the only time that day that a spear hit a rock. Ryan let me try with his pole spear too. I managed to touch a fish with that but didn't manage to actually kill anything. Part of my trouble was that, aside from a couple fish I'd seen them spear, I wasn't sure which were good to eat and I didn't want to kill something we weren't going to use. When we were all done, Mohuho, asked me to go down and untie their bow line from the reef below and I felt somewhat redeemed from poor spear fishing performance when I was able (just barely) to get the line up on my first try. When all the boats were untied, we went in and landed on the sandy beach of the little bay were they live. 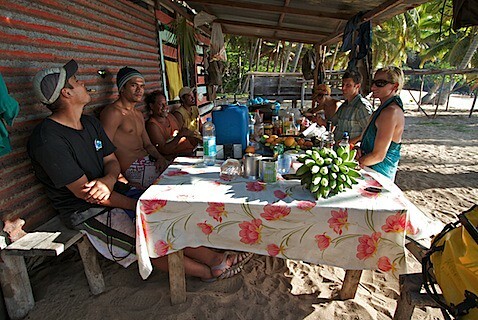 Nahau, the surfer guy we'd met previously, and Moana, who we hadn't met before, already had a ton of fruit laid out on the table, had the grill going, and were preparing some kind of marine snail (the shells were already gone so I never did figure out what they were). While the octopus and fish was cooking, they gave us coconuts to drink from and showed us how to eat some unfamiliar fruit and how to scrape out and eat the lining of the coconuts after we'd finish drinking the fluid part. Anyone who knows me knows that I'm terrified of eating unfamiliar foods. However, in this setting, not wanting to try to explain to our hosts through Alex's translation why I was refusing to put the snail in my mouth, I managed to eat it. ...not that it was easy. The taste wasn't bad at all but the texture (and probably the thought of what it looked like) gave my gag reflex a couple of kicks that I had to suppress. I made it through the whole meal without anyone noticing my odd food phobias while silently thanking my lucky stars that vegetables don't make up much of the diet around here. It turned out that all of that was just appetizers. The fish and octopus got done on the grill and they brought out several pots of stuff they'd prepared earlier. We were given plates and offered our pick of lobsters, a couple kinds of crab, coconut rice, shredded coconut salad, octopus, a few different kinds of fish, salted pork, and more fruit than you could shake a stick at. We had brought rum and soda to share and Alex a Ryan brought a bottle of wine. Both were well received. Alex probed them a bit about things they wished they had and general dissatisfactions about living on the island. Fiu mentioned wishing they had some solar panels and batteries so they could charge their gadgets and have better light at night but the main complaint didn't really have to do with something that could be bought. With only around 30 or so different families living on the island (and most of them being related to some degree), it seems that finding a girlfriend is pretty much an off-island activity and without much in the way of financial resources, getting off the island isn't easy. Nahau solves this problem by playing football (or what we Americans, for some reason, insist on calling soccer) in a league that takes him to games all over the archipelago where he has a chance of meeting girl who's not his cousin. As far as I could tell, the other guys just resigned themselves to the lack of female company. After lunch they took us on a little tour of their valley. Fiu showed us the pig / goat trap they have set up. He even sprang it for us and showed us how to rebuild it. Nahau tried to show Ryan and I how to climb a coconut tree. I only got 4 or 5 feet off the ground before giving up. Ryan did a bit better but, for the time being, I think all the coconuts in the tall trees are safe from us. The valley was beautiful and really reminded me of reading Typee by Herman Melville (though that book is actually set on Nuku Hiva to the north - where we'll be going soon). The only draw back to the place was the bazillions of mosquitos. After some group photos, we asked them to come by the boat on the following day so we could give them some gifts to thank them. We had offered to load their iPod and PSP up with music and the photos we'd taken so we took those with us back to the boat. They insisted that we take the leftover food and fruit so we loaded up our dinghies and headed off. Fiu and Nahau came by the next day (with even more fruit for us) and we invited them aboard. We managed to have a somewhat successful conversation with them in broken French and English, we played the guitar a bit, and showed them where we'd put the music and photos on their devices. We also gave them a little LED lantern we had that could be charged with a hand crank. We'd just about exhausted our conversational abilities when Alex and Ryan again came to our rescue and helped us say our goodbyes and get their address. All in all it was an amazing experience. It was great to meet these guys who, in terms of material wealth, don't have much but exhibit such generosity and dignity. They knew that we had stuff that they would like to have and made it clear that they were willing to trade what they had for it but never asked to be given anything and never complained or showed the slightest irritation when they asked for something in trade that we were unwilling to part with. It was also really cool to meet people who have such a strong connection with their home. Being from a country populated predominantly by immigrants, it's amazing to me to imagine living in the valley that's belonged to your family for as long as anyone can remember. I'm glad you're enjoying the blog. We miss you guys and think of you often. I really hope that you can get out and visit us at some point. ...perhaps New Zealand if not sooner. Regarding the tattoos: Stay tuned for the next post. Should have it up in a couple of days.